Since the season is over and the Rhinos are formulating their plans for the off season, I felt it was a great time to take the temperature of Rhino fans with regards who they would like to see back next season and who they would rather not see come back to the team in 2007. I asked fans to rate 28 players and the coaching staff on a scale from 1 (Has to go) to 5 (Has to stay) and I received 21 responses. While there were plenty of interesting things about the responses, perhaps the most eye opening was the fact that 16 different players had a score range of 1 to 5 (meaning that at least one person rated that player a 1 and at least one person rated that player a 5) and that not even team MVP Scott Vallow got a perfect score in the poll. Given the way the season turned out, I don't believe that it should be at all surprising how happy the fans are with Vallow and the Rhinos defense in comparison to the bulk of the midfield and the forwards. The most surprising things to me in these two areas are that Vallow didn't get 5s across the board, someone rated Kenney Bertz as a 2 (ahead of only Jason Perry amongst the defenders), Palguta was rated as high as Sanfilippo, and that Ricky Lewis was rated higher than Nate Craft. And I completely expected Kevin Taylor to be the lowest rated defender. He cinched that in the Miami FC game, I'd bet. In the midfield, the first surprise is that the leading vote getter is a guy that never played one minute in the 2006 regular season for the Rhinos in Jonathon Bolanos. Apparently a lot of fans felt that the largely ineffective play in the midfield this past season could have been different had Bolanos not suffered a season ending knee injury during the preseason. And the fans have a lot of confidence in Bolanos being able to come back strong next season. I'm not surprised to see Danny Kramer at the bottom of the midfield rankings. Nor am I surprised to see Jonny Steele near the bottom. I am sort of surprised that Mike Ambersley and Neil Dombrowski were rated as low as they were as I'd put them in the same category as Josh Bolton as young players with potential. Amongst the forwards, the only shock there to me is that Chris Bagley was rated slightly higher than Matthew Delicate who finished the season as the Rhinos leading scorer. I liked what I saw out of Bagley in his short time with the Rhinos this year, but I don't know that I would rate him ahead of Delicate. Charles Gbeke and Connally Edozien ending up at the bottom of the forward rankings was expected. Although, given his production per minutes played, Connally Edozien might have a case for the most underrated player in this poll. But, when you go on the post game show and talk about how you were tentative in front of goal, you probably aren't going to win a lot of fans over. The coaching staff got pretty consistent 3s and 4s from most of the respondents. 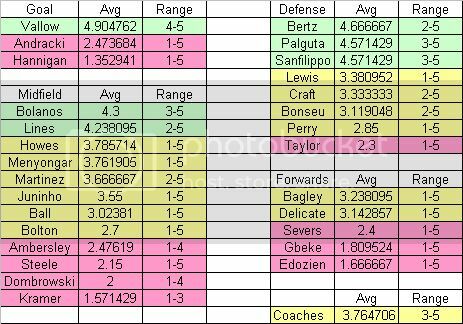 Two people however chose to rate each member of the coaching staff individually and that is where some lower scores, which weren't used in the average or range calculations, were submitted. Tomorrow I will present my thoughts on who the Rhinos should keep and what direction the team should during the off season.